Iranian President Hassan Rouhani said Tuesday his country is in a “fight” with the U.S., a day after protesters angered by Iran’s tanking economy confronted police in front of parliament. “The U.S. cannot defeat our nation, our enemies are not able to get us to their knees,” he said. 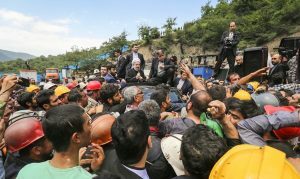 Rouhani’s comments came after protesters angered by Iran’s tanking economy confronted police in front of parliament Monday. It was the first such confrontation since similar demonstrations rocked the country at the start of the year. Tehran’s grand bazaar was shut down Monday as merchants joined street protests and thousands defied thuggish regime riot police trying to quell the rebellion. Other big cities joined Tehran as well. Protesters carried signs like “Leave Syria alone, think of us.” Hezbollah, Islamic Jihad and the Houthis — all proxy arms of the Islamic Republic’s strategy of spreading its version of the “Islamic revolution” across the region — weren’t spared protesters’ ire either. Iranians have been protesting all year. Truck drivers, unable to afford gasoline, have been on strike. Others, including past regime supporters, also turned against Tehran’s pricey adventurism in the region while ignoring troubles at home. Much of it is because the mullahs can’t manage their moola. Iran has problems–some of which are being caused by the USA. And the Iranian regime does not like the USA or its President Donald Trump. Now, there are a couple of ways Iran could try to fight the USA. One would be to reduce oil production. But since that would hurt Iran’s economy much more than that of the USA, that is not expected. Another would be to trade with the Europeans, despite USA sanctions. Iran wants to do this, so expect to see it work to make deals with Europe that the USA is opposed to. Another would be to continue to support Hezbollah, Syria, certain groups in Yemen, etc. Iran expects to do that, but whether or not it can increase such support is a question. Now there is a more dramatic way to fight the USA. That would be to launch an attack against the USA’s ally Israel. Iran has long wanted to eliminate the nation of Israel and takeover Jerusalem. 6 Elam bore the quiver With chariots of men and horsemen, And Kir uncovered the shield. 7 It shall come to pass that your choicest valleys Shall be full of chariots,And the horsemen shall set themselves in array at the gate. 8 He removed the protection of Judah. You looked in that day to the armor of the House of the Forest; 9 You also saw the damage to the city of David, That it was great; And you gathered together the waters of the lower pool. 10 You numbered the houses of Jerusalem, And the houses you broke down To fortify the wall. 11 You also made a reservoir between the two walls For the water of the old pool. But you did not look to its Maker, Nor did you have respect for Him who fashioned it long ago. Elam is a reference to at least some in Iran. Kir is of interest as it has several possibilities. One is that the Bible tells that after Tiglath-Pileser king of Assyria took over Damascus, he moved Syrians to Kir. While this does not mean that Kir must (or must only) be a reference to Syria, the fact that Syria is an ally of Iran is interesting. Some believe Kir is an area in the south of Iran, while others suggest closer to the Black Sea. The Bible tells of a time when Kir will be destroyed (Isaiah 15:1b) and also says that Syria’s capital Damascus will be destroyed (Isaiah 17:1). As far as Iran goes, it will have problems per Jeremiah 49:34-38 (see also Iran in Prophecy). In Isaiah 22: 8, “Judah” is a reference to those in the land commonly called Israel–God will allow Israel to be attacked! In Isaiah 22:9, consider that “the damage to the city of David” is a reference to at least part of Jerusalem–and notice that the damage will be great. 27 Then he shall confirm a covenant with many for one week; But in the middle of the week He shall bring an end to sacrifice and offering. And on the wing of abominations shall be one who makes desolate, Even until the consummation, which is determined, Is poured out on the desolate (Daniel 9:27). Most prophecy watchers consider that the deal of Daniel 9:27 is some type of a peace deal based on this as well as other prophecies in the Book of Daniel (see The ‘Peace Deal’ of Daniel 9:27 ). With the nation of Israel believing that it faces little risks since US President Donald Trump has been providing support in many ways, it is unlikely that Israel will agree to a regional peace deal until it has been damaged militarily. Since prophecy shows that Israel’s capital will be greatly damaged and Iran is facing protests, one way for Iran to change the narrative would be for it to attack Israel. A temporary ‘peace deal’ will come to that region–and peace deals most often come after wars. Iran in Prophecy Is Iran in Bible prophecy? If so, what does the Bible teach? What names, other than Persia, may be used to describe Iran? There is also a YouTube video titled Iran In Prophecy. Syria and the start of World War 3 On April 14, 2018, Syrians were awoken by the sounds of about 120 missiles/bombs sent against areas of their country. The United States of America, United Kingdom, and France launched this attack related to claims of chemical weapons use earlier that week. Will Syria’s capital one day be destroyed as prophesied in Isaiah chapter 17? If so, could this be before the start of the Great Tribulation? Are there prophecies about Syrians and the UK and USA? Is this attack against Syria leading to WWIII between the USA/UK/France and Russia/Syria/Iran? Is there an Arabic power that will rise up and be destroyed before the Great Tribulation as Tim McHyde has written related to Psalm 83? Is Ezekiel 38/39 about to be fulfilled? Who is the biblical King of the North and the biblical King of the South? Will the Beast power destroy the USA and its Anglo-Saxon descended allies (like the UK, Canada, Australia, & New Zealand)? Could this be WWIII and the start of the Great Tribulation? What is the prophetic sequence of events according to Jesus and Daniel the prophet? Dr. Thiel addresses all of these matters and more. This is a video. Damascus and Syria in Prophecy Will Bashar Assad hold power as he has it? Does the Bible show that Damascus, the capital of Syria, will be destroyed? What will happen to Syria? Will the Syrians support the final King of the South that the Bible tells will rise up? Which scriptures discuss the rise and fall of an Arabic confederation? Does Islamic prophecy predict the destruction of Syria. This entry was posted on Tuesday, June 26th, 2018 at 5:00 pm	and is filed under Prophecy.